View this great article written about our Alzheimer's Clocks in The Huffington Post by Sarah Archer. 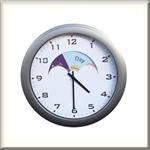 The clock is not only suitable for Assisted Living Facilities and Memory Care Centers but lobby and vestibule areas of offices, showrooms and schools. This clock should be behind every reception desk. IT SIGNIFIES TO THE PATIENT AND CUSTOMER THAT YOU ARE A DEMENTIA FRIENDLY ENVIRONMENT. 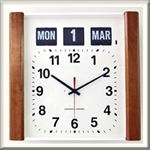 From our dementia clocks that display the day of the week to our Alzheimer’s clocks that clearly indicate day and night, you can help reduce your loved one’s anxiety. They will not have to worry about whether they are missing an appointment, their favorite show or any other key event. Browse our site to find the right clock for your loved one or, if you have any questions, give us a call at 1-800-752-3238 and we can help you make the right decision for your family.